Sweet & Sticky Teriyaki Meatballs piled on top of a really yummy broccoli fried rice. 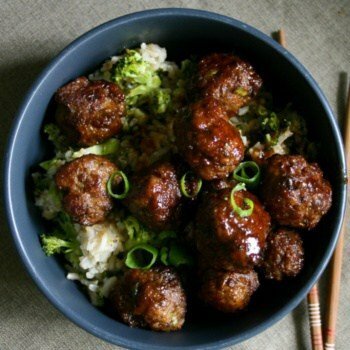 Step aside regular ol’ meatballs because we’re about to spice up tonight’s dinner with these Asian inspired delights. They are crazy delicious and a healthy dinner recipe that looks a little like junk food. The kids will be fighting to get the last one! Ever had those days when you open the freezer and the only thing in there is frozen ground beef? Pffft. You’re a parent. I know you know what I’m talking about here. For some reason, it’s always the last thing left in the freezer the day before the next grocery shop. Not that I’m complaining (coz I’m always glad to see a trusty pack of ground beef in there). Mostly because it’s a super versatile ingredient and budget friendly. And a little goes a long way. But to be super honest, they have been coming around a little too regularly. As in weekly. In the same order. So I thought I would take it up a notch and try out an Asian inspired version of this family favourite to serve with my new favorite obsession – broccoli fried rice. A Quick Note about Broccoli and Kids. Not all kids like broccoli. But all kids can be taught to eat it. If your little one (or big one) is kicking up a fuss about eating broccoli then try serving it up in a different way. For a fussy kid, a heaped pile of the green stuff on their plate is enough to send them into shock. Fussy Kid Tip: Broccoli can be cut up really fine and once added to casseroles, stir fries or soups, it virtually disappears. Even the most particular child will have a tough time picking out the pieces. There are 3 simple steps to this recipe. Make the meatball mix and fry briefly to brown the meat. This should take about 5 – 8 minutes. You don’t have to cook them all the way through. It’s just to brown the outside and seal in all the flavour. Make the Sauce mix. With a combination of Ginger, garlic, soy sauce and honey you know this is a goodie. Pour the sauce over the meatballs and bake on med-high heat for 15 – 20 minutes until sauce is thick and sticky (this will thicken a bit more once it cools). This is a fast and ridiculously delicious family weeknight meal which you should be able to get on the table within 30 minutes. Oh quick disclaimer here – I’m assuming the ground beef is defrosted. Because mine wasn’t and I had to wait another 11 min 48 seconds while it defrosted in the dreaded microwave (I still don’t like using it). One last thing … and this is important …because you’re the cook, you get to lick the spoon. If you want some more Kid Friendly Clean Eating Recipes delivered right to your inbox, then join over 3,000 other Moms and sign up to my newsletter below. Every week I send out two tried and tested real food recipes that your family will love. All my recipes are made with real, easy to find ingredients. No fussing around with odd ingredients you only use once. Oh and I’m a big fan of minimum prep work and easy dinners, so you won’t be disappointed. 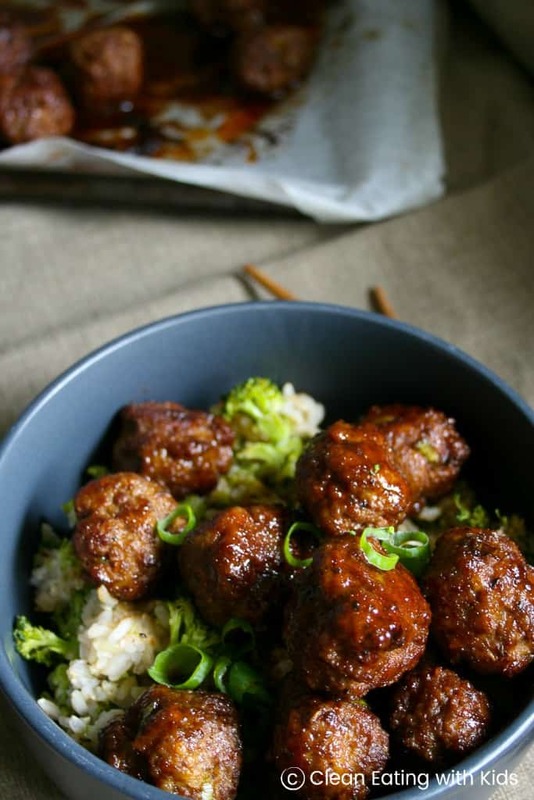 Sweet & Sticky Teriyaki Meatballs piled on top of a really yummy broccoli fried rice. To Make the Meatballs: Mix all meatball ingredients together until well combined. Using your hands, form the mix into walnut sized ,meatballs. 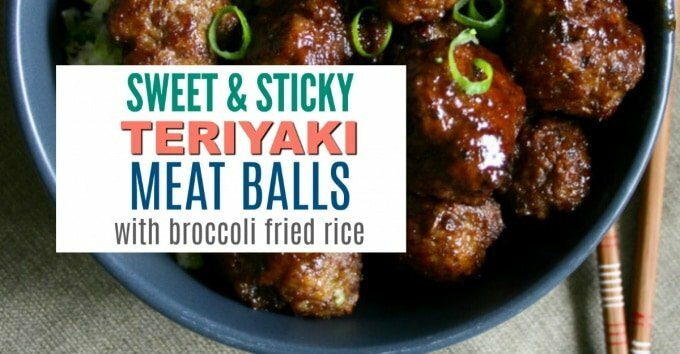 I like to think that each meatball is about two bite. Heat a pan on the stove and add a little olive oil to prevent sticking. Fry your meatballs in two – three batches for around 5 minutes until lightly browned all over. I use a spoon to turn them over in the pan. 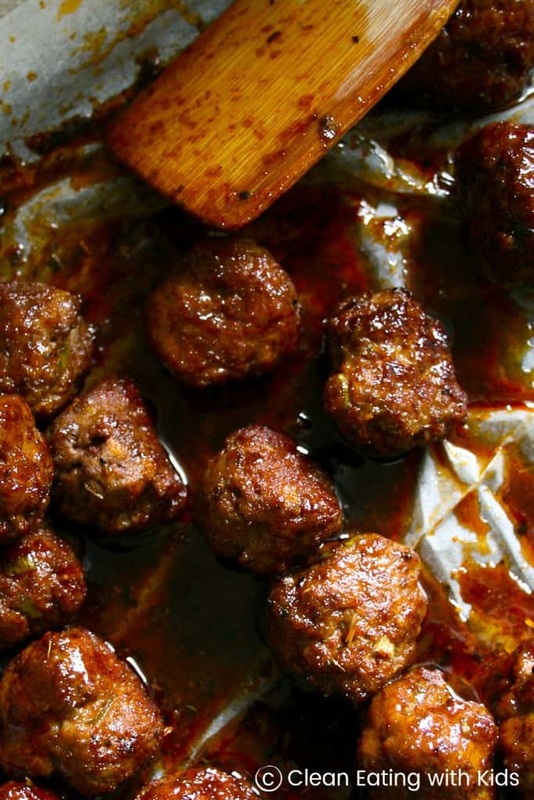 Remove the meatballs from the pan and place them on an oven tray lined with baking paper. This recipe makes around 15 – 20 meatballs. To make the Sauce: Add all sauce ingredients to the meatball pan (this saves on washing). Bring to the boil. Then pour over the tray of meatballs. 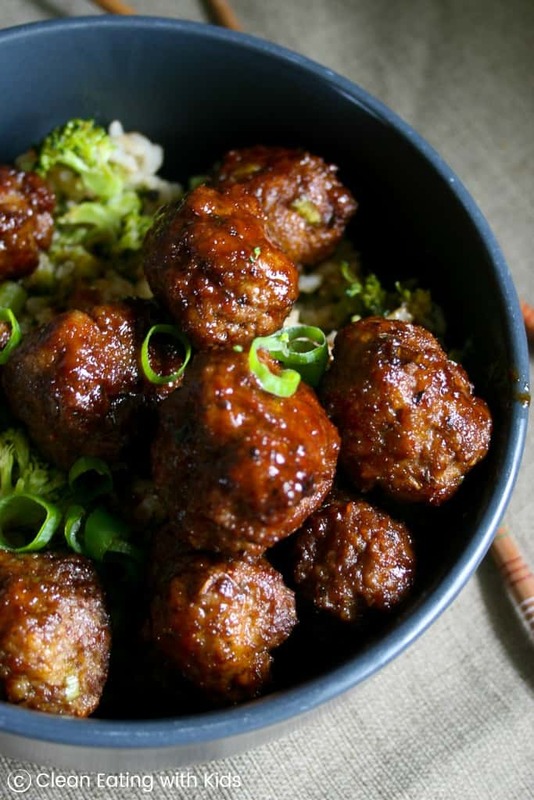 Pop the tray into the oven and bake for around 15 – 20 minutes until meatballs are cooked through and sauce has thickened.